Need a quick appetizer recipe? Here's another winner from our KRAFT KITCHENS recipe developers: crunchy crackers stacked with saucy chicken, cheese and oregano. Cut each cheese slice diagonally into 4 triangles. Toss chicken with pasta sauce. 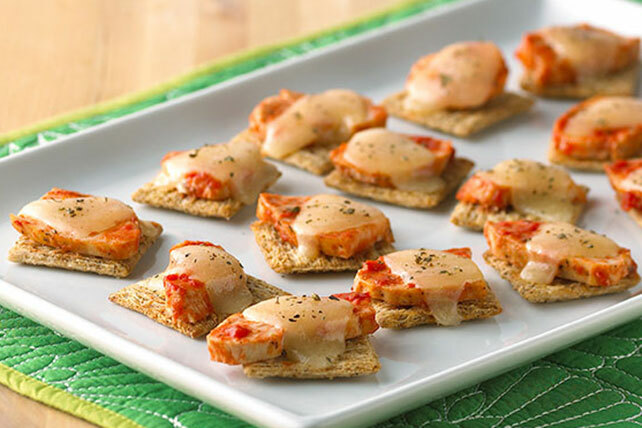 Place crackers in single layer on baking sheet; top with chicken mixture, cheese and oregano. Bake 5 to 6 min. or until cheese is melted. Top crackers as directed. Place 8 crackers in single layer on microwaveable plate. Microwave on HIGH 10 to 15 sec. or until cheese is melted. Repeat with remaining topped crackers. Prepare using 1/4 lb./115 g meat cut from a store-bought rotisserie chicken.